U.S. home prices rose a seasonally adjusted 0.6% for January, according to a Federal Housing Finance Agency House Price Index report [link opens a PDF] released today. After bumping up a revised 0.5% in December and 1.4% for Q4 2012 overall, this newest report reflects another solid month for the housing market. In 2012, home prices jumped up 6.5% and are currently comparable to September 2004 and 2009 levels. Looking across the United States, from December to January, the Pacific region recorded a 1.6% price increase, followed by a 1.0% bump for the South Atlantic states. New England prices dropped the most (-0.7%), while the East South Central U.S. dipped 0.5%. On a longer-term scale, house prices for the Mountain region (Montana, Idaho, Wyoming, Nevada, Utah, Colorado, Arizona, and New Mexico) jumped 14.1% over the last 12 months, while Middle Atlantic homes (New York, New Jersey, and Pennsylvania) brought up the rear with a 0.4% price bump. 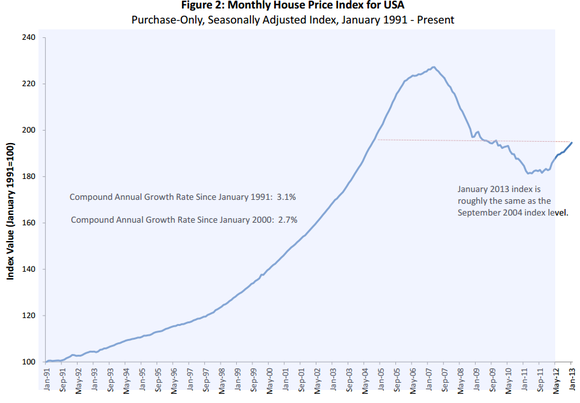 The article U.S. Home Prices Rise to 2009 Levels originally appeared on Fool.com.